Home Differences What is the Difference Between Bookkeeping and Accounting? Both bookkeeping and accounting are used interchangeably in the financial world, however, there is a notable difference between bookkeeping and accounting. Bookkeeping is a part of accounting whereas accounting itself is a wider concept. The input of invoice and voucher details into ERP systems. Receiving and recording payments by customers. Making and recording payments to vendors. Efficiently processing payroll information, etc. Preparation of a trial balance, ledger accounts, etc. 1. Bookkeeping is mainly related to the process of identifying, measuring, recording and classifying financial transactions. 1. Accounting is the process of summarizing, interpreting and communicating financial transactions which were classified in the ledger account as a part of bookkeeping. 2. It is the beginning stage and acts as a base for accounting. 2. 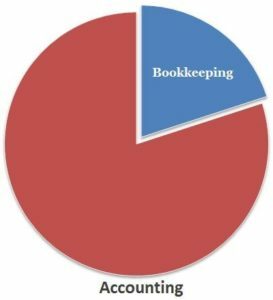 Accounting begins where bookkeeping ends. 3. Management can not make decisions based on bookkeeping. 3. Management can make decisions based on accounting. 4. The objective of bookkeeping is to keep proper and systematic records of financial transactions. 4. The objective of accounting is to ascertain the financial position and further communicate the information to the relevant parties. 5. Financial statements are not prepared during bookkeeping. 5. Financial statements are prepared on the basis of records obtained through bookkeeping. 6. Bookkeeping doesn’t require any special skills as it is mechanical in nature. 6. Accounting, on the other side, requires special skills due to its analytical and somewhat complex nature. >Read What is an Accounting Cycle or Accounting Trail?